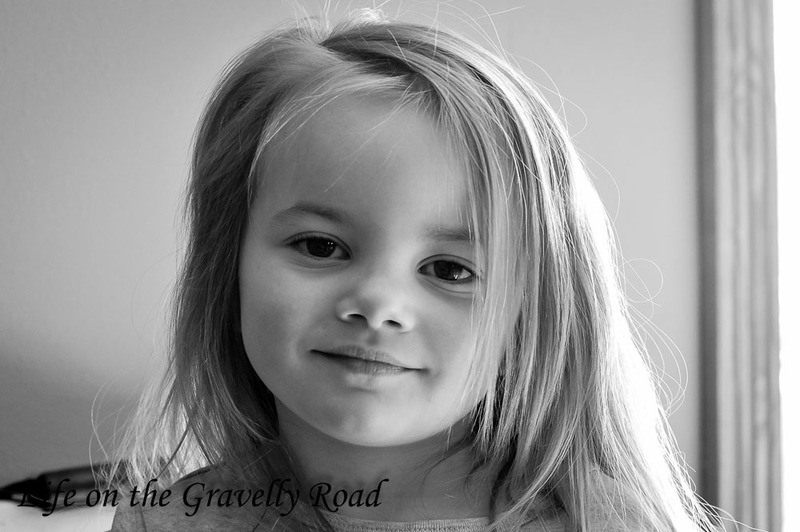 Life on the Gravelly Road: Happy 6th Birthday! 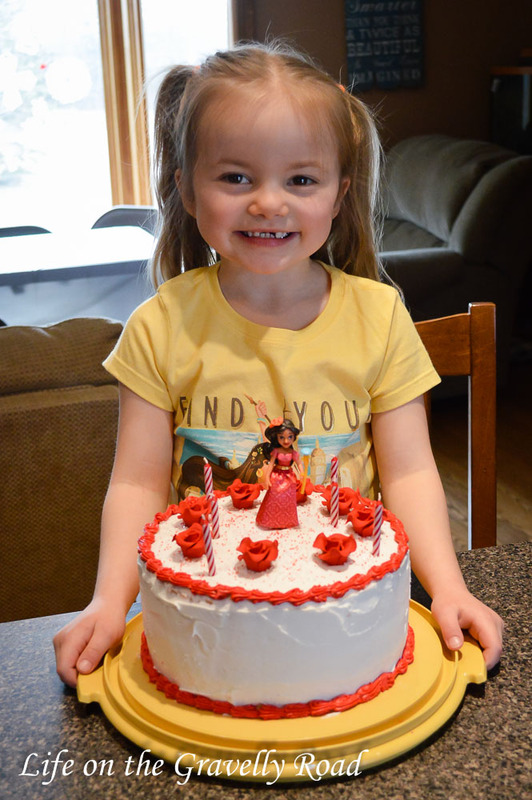 Happy birthday to our joyful new 6 year old! Her big smiles, infectious laughter and silly songs fill our home and we can't imagine life without her. 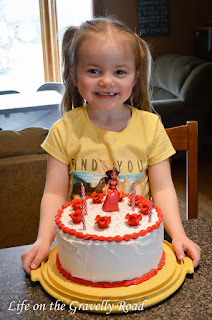 We celebrated her birthday over the weekend with family -- a fancy Princess Elena cake, tons of excitement and so much of fun. On her actual birthday, she opened one more present at breakfast, made delicious cake pops with mom for snack with her brothers after school (using a new cooking kit from grandma) and had a special supper of her choosing. And as is tradition, here are some of the highlights of her year as a 5 year old as told by mom. * You continue to love everything about preschool! Last school year you attended two days a week but this fall you started a new preschool (where Zman had gone) five days a week and you have flourished. It has been a joy to see you make so many new friends, working hard at speech, and soaking up all the fun learning you get to do. Kindergarten is just around the corner and we can't wait to see God's plans for you there too. * You are kind-hearted and thoughtful -- making your friends and teachers special notes and pictures at home to bring the next day, asking if I can send a special picture to a loved one you are thinking about, being so excited to dance at the nursing home, and wanting to help where ever you can. * You started dance this past fall and it has been fun to watch you pour yourself into it. The first few weeks there were some tears... not about going to dance but that you had to wait a WHOLE WEEK before you got to go back. You listen well and love to show us all that you are learning. Keep practicing hard and doing your best -- they are great skills. * You love to pretend. Whether you are playing dolls by yourself, house or store with your brothers, or some other imaginary game outside, you love the big stories and adventures. 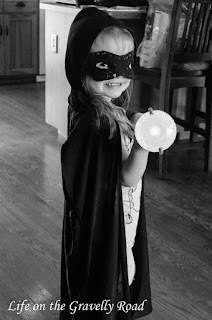 From a big sister, a veterinarian, a mom, or a princess warrior, I love hearing all the big roles you pick for yourself. Keep using your imagination to tell the stories inside you and keep dreaming big. * Drawing, coloring, art and projects are some of your favorite things. While your brothers are in school in the afternoon, you spend a lot of time at the table drawing pictures and coloring. You love the projects you do at school and are always asking to do more at home too. Cooking projects is another favorite and you are so willing to help in the kitchen. You are loving the special baking sets grandma gave you and they are a very delicious project we can do together. * You are determined and work hard at all you do. You don't give up with things are hard even though they frustrate you -- speech, swimming lessons and tball have been big examples in the last year. Learning to ride your bike without training wheels was a big accomplishment this year and your determination translated into figuring it out in one afternoon of practice. I know its hard when you are often the smallest in the group at school or with friends, but your determination serves you well and you accomplish so much. * You relish your role as the only girl and little sister, even though you ask all the time for a baby sister. I treasure the times its just the two of us and we get to have girl time and I'm glad you look forward to it too. As much as they can tease you at times, know that your brothers are looking out for you, especially when you start kindergarten in the fall. Happy birthday blessings! Mom and Dad love you so much and pray your year as a 6 year old is full of new adventures, special memories together and lots of learning. We are excited to see God's plans for you as He continues to mold you into the young lady He has designed you to be someday.